1) The app should be able to serve as a “tour guide” to the millions of visitors who visit the memorials in person. 2) The app should provide enough detail about the memorial that visitors who aren’t able to visit in person can still benefit. They did face some challenges, but as this was their first mobile app, they were not only able to get their feet wet, but they also learned valuable lessons to help them create future mobile apps for their other memorial sites. 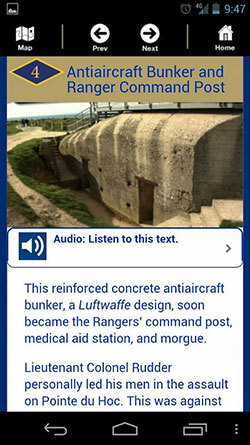 The Pointe Du Hoc app tells the stories of the 2nd and 5th Ranger Battalion who found themselves in Northern France and on cliffs on D-Day. 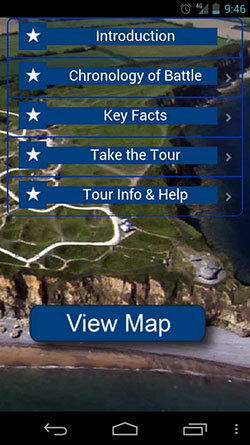 The app allows you to navigate through: an introduction, chronology, key facts, a tour menu, a map, and even points of interest. The idea to include all of these features was a process the team discussed both internally and with their developers. Their team did ask for recommendations and often asked them to see their ideas before approving them. presenting certain story lines in the app. This is vital because they realized a mobile application is not a linear experience. For instance, it is not the same as a visitor’s center where visitors move from one panel to the next. They wanted to give their mobile users options to dive into the stories they were interested in, so they had to think strategically how to present them. 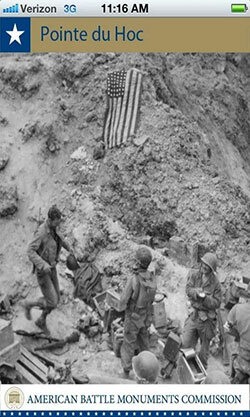 They had a lot of internal discussion, as well, and the application was vetted by their communications team, their historians, and guides who worked at the Pointe Du Hoc site. As a part of this overall process, they learned that having mobile devices for agency testing and setting up an Apple developer’s account would be critical in moving forward for future development. What’s in store for ABMC’s mobile future? The ABMC is currently working on five other applications. They know that these apps will be different from their first one because the memorials and the stories they tell are different. They will once again need to figure out how to incorporate the larger stories, which feature hundreds of units of all different ranks. First, they discussed why they wanted a mobile application. In ABMC’s case, not only were they aware of the growing trend of mobile devices, but they realized they had an opportunity to reach users from all over the world, and in addition, enhance the experience of in-person visitors. Next, AMBC discussed how they wanted to present their story on the mobile platform. With so much to explore at a memorial, what content do they want to provide, what stories do they want to zone in on, and how do they present them to the user so that he/she doesn’t feel that they must adhere to a specific path while they use the application. They shared their application internally and allowed employees to review, to test, and to provide feedback before it was released. Because of the agency’s relatively small size, they took advantage of the Mobile Application Development Program on DigitalGov and referenced other best practices. Moreover, AMBC leveraged the MobileGov Community of Practice and found it to be a fantastic resource. Finally, AMBC listened to their users and while the majority of their feedback was positive, there was some constructive criticism that was beneficial to the agency in making iterations and in creating their future applications. The process of developing your first mobile application can seem overwhelming and challenging but it can be done as the AMBC case demonstrates. In their case they focused on the needs of the user. Last year the Mobile Gov Community of Practice released over 40 Mobile Gov User Experience Guidelines and Recommendations. On Monday August 4th, the community is looking for your input as we work on updating the Guidelines to adjust to the newest trends in application development. If you would like to contribute, you should register for our workshop here! Thanks to Mobile Gov Community of Practice member Sarah Hermann of the American Battle Monument Commission for telling us about her mobile journey!